Ben, Rachel and Christine after receiving their certificates! Read about the time Ben spent at Mildmay Hospital in Kampala taking a course on comprehensive HIV/AIDS care and management! “The new ROWAN nurses, Rachel and Christine, and I just completed a comprehensive course on HIV/AIDS at Mildmay hospital in Kampala. The course taught the three of us about the current treatments and policies of the illness as well as some of the history of HIV/AIDS in Uganda. However, the most significant thing that the course made us aware of is that HIV/AIDS is more than just a physical illness; therefore it requires a holistic approach to conquer it. It is widely known that the lack of knowledge about HIV/AIDS causes a great stigma around those that are infected by it. A team effort is essential to beating this illness. This course opened my eyes to the numerous dimensions of this illness. For instance, babies that are born to HIV positive mothers can remain HIV free as long as the right steps are taken during birth and breastfeeding. I also had the privilege to hear a doctor speak that has been living infected with HIV for the past 30 years. The doctor was living proof that someone can live a full and happy life while infected by HIV as long as they continue their ART (Antiretroviral Therapy) and never lose hope. Hannah is a college student at Cornell University. 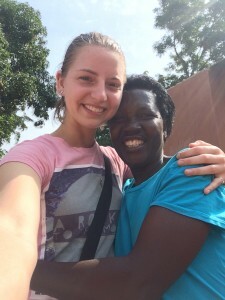 She just returned from her first visit to Mawanga and here are some of her reflections. Mawanga welcomed us with open arms, literally. Women and children created a sea around us as we got out of our car of hugs and trills of joy, touching us and feeling us without any reservations or hesitations. There was no waiting to see if they would love us, no proving our worth. They jumped straight in to unconditionally loving us. As much as the villagers showed us immediate friendship, Pastor Paul and the ROWAN staff showed us the meaning of loving people through long term relationship. 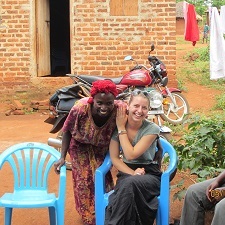 Much of our time spent in Mwanga was filled with home visits. Home visits are the backbone of ROWAN. Going to members, checking up on their well being, spending time with them, praying with them and showing they’re loved is the foundation of ROWAN as an organization that is built on relationship and long term loving of people. Liz and I led the devotion time for the kid’s Saturday program. We told them the story of Jesus walking on water and saving Peter when he began to sinking because he lost faith. We each shared a story from our life of a time when we stepped out in faith when God called us to but got scared and let our eyes wander from focus on Jesus. We acted out the story using a sheet as water and had many of the kids participate in the skit, they love acting and stories and lots of participation! After their devotion they go through a roter of activities. They cycled through career counseling with Eddy; football (soccer) with Ben; boondoggle with Liz, Aubrey and I; and letter writing to sponsors with Sam. So many of the kids clothes are ripped or ill-fit to the point of almost falling off of them. One little guy, James, had pants that were in pretty rough shape. Lauren and I took him into the office and I got one of the old foot pedal sewing machines working and fixed them up for him. He was such a cutie and pretty shy even for a 4 year old. After dinner we all sat around and talked about the day or ROWAN or members or anything. This night Pastor Paul, Aubrey, Sam and I vision casted for the land ROWAN just bought and dreamed of how we could use it, especially a secondary school that is on Pastor Paul’s heart. 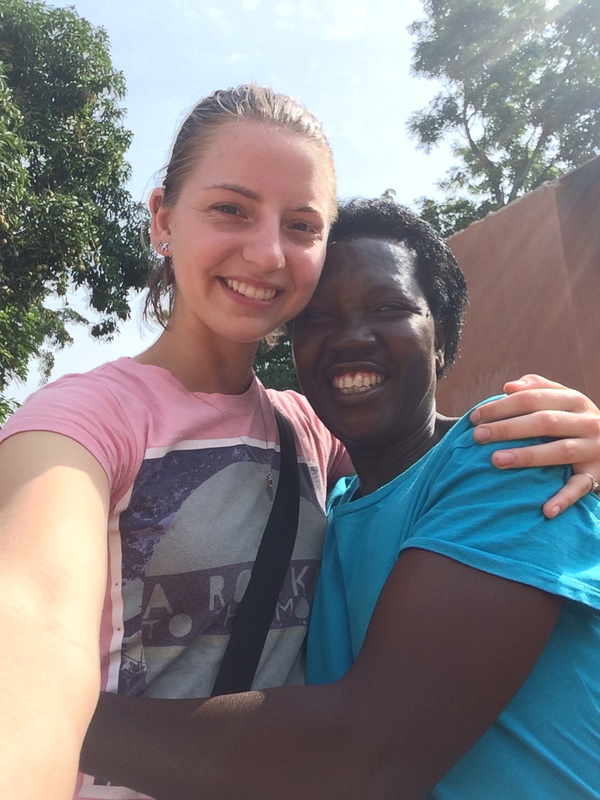 Not only did Mawanga help me to understand Ugandan culture and the people, it helped me understand American culture as well. While there were so many wonderful things about Mawanga that I wish were part of American culture I now recognize that there are things that Ugandan culture could learn from American culture as well. They each have their own personas which have their own strengths and weaknesses, just like individual people and we need each other to help each other grow. We have so many tangible blessings in the form of things and infrastructures and efficiency in everyday life that Uganda does not have. However, the people of Mawanga have intangible blessings that we do not have. They have contentedness, community, gratitude, joy and now, thanks to ROWAN, hope. These are things that so many of us including myself lack on a day-to-day basis. How many times I pass up having a meal with a friend because I’m “too busy” or because it’s not convenient. There’s a blessing in having nothing in life convenient, you work to do the things that are important rather than doing the things that are convenient out of default. I am so blessed to have had this opportunity! Thanks to every one of you that prayed for me and gave to my trip! I will be continuing work with ROWAN as they work with an architect to plan how to use their 8 acres and turn it into the ROWAN campus. I will be helping them with strategies, brainstorming and the design work for that. I hope to return soon to Mawanga and retain the relationships that God has ordained there. ROWAN is getting very close to sponsoring the rest of their regular members! Once they do, they can begin sponsoring the next tier of 150 HIV+ in their communities! Please help us! It is $38/month to sponsor a widow or orphan. Click the link to look at the widows and orphans that are up for sponsorship right now and learn about them and what your support will help them do! ROWAN is unique in sponsorship of members past high school. Other organizations only sponsor students to finish high school and often times life is still difficult for them and they need help to continue their education. ROWAN sponsors orphans all the way through higher degrees. One of our volunteers named Eddy is a ROWAN kid and soon finishing his law degree! Meet Aisha, she has eight children and is HIV positive. She is a widow. Her husband died of HIV; however, he concealed his illness and refused he had it. Because if this denial he never received treatment. Aisha is very strong. She grows her own food, both to sell and to feed her family. She educates her children and takes the necessary steps to be informed about her illness. Yet, she is very vulnerable. Her husband had two other wives and left sixteen children total, all sharing one small plot of land. Aisha and her children have been victims of property grabbing. In the middle of the night one of her stepsons came and burned her house down. After the home burned down, she started living in her husband’s brother’s house. Soon after she started living there, he died. Since which, she has been violently threatened to leave the land by the rest of her husband’s family. If that isn’t bad enough, the same stepson that burned her house down before is threatening to do it again, this time with the goal of Aisha and her children in it. Aisha is a single mom just trying to make a living, care for and educating her eight children while also managing a serious illness. Property grabbing is not just a family matter as many would like to believe, it is a criminal matter. Women’s property and inheritance rights are being threatened constantly in Uganda. With that, the lives of women and children are in jeopardy. We couldn’t stand and watch these egregious acts occurring anymore. That is why we formed the ROWAN Property and Land Protection Program. We feel strongly about the importance of this program because we are called to seek justice, to defend the oppressed, to take up the case of the fatherless and to plead the case of the widow. We are called to plead Aisha’s case. While the team was here last week we were privileged to meet a group of extraordinary women who rallied their strength together to start a joint farm. Gimbo and her sister Sophie started their journey with ROWAN when they found out they were HIV positive. They became depressed, hopeless and burdened by the stigma they were facing. They believed they would die soon, which didn’t leave much will to live. So instead they sat idle awaiting their death. Then they met Juliette. Juliette is a ROWAN zone leader. Juliette became a zone leader when she found out she was HIV positive. Now she is helping her community do the same thing. Through Juliette’s counseling and educational teaching, Gimbo and Sophie have hope about their status. They now know they can manage their illness and live a very full life. Juliette, Gimbo and Sophie are part of our farming program and learned the necessary skills to start their own, large scale, banana farm! They are now able to sustain themselves by selling their harvests commercially. This work takes incredible strength and these women joined together, despite challenges and made it happen. We are so incredibly inspired by their story.